Oxygen directly or indirectly determines the phenomena experienced by wine during barrel aging. The published works up to now do not establish definitive conclusions about how an oak barrel works. These last years the research group UVaMOX has focused its research efforts on the study of different aspects that determine the entry of oxygen into the wine in barrel. 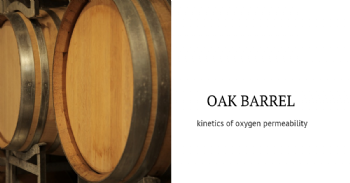 The kinetics of oxygen permeability in new oak barrels for 1 year was analyzed and a non-steady annual oxygen transmission rate of a barrel was established . Oxygen-imaging technology to study oxygen dynamics in wood which enabled the visualization of oxygen transport through water saturated humid wood was used, confirming that French oak wood is permeable to oxygen. Besides, the formation of the headspace in a barrel from the interior while monitoring what vacuum originated for each kind of oak wood was filmed. The results show that the classification of rough stave wood in cooperage has indeed allowed the construction of barrels with high and low oxygen permeability. Moreover, it was confirmed that the toasting and bending processes are important in the oxygen permeability decrease in oak wood used for barrel making.